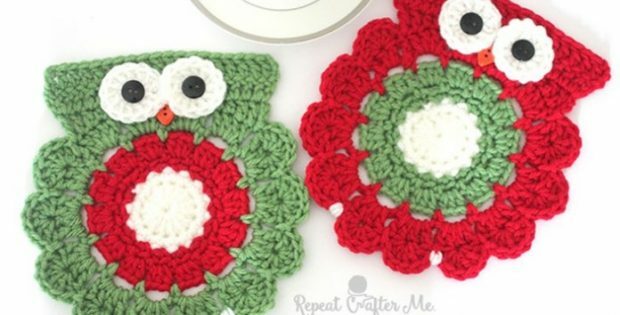 These lovely Christmas crocheted owl coasters will bring a bit of fun to your table this Christmas. Alternatively, you could turn these great crocheted coasters into trivets by adding a few more rows. This is a quick and easy project that you will have finished in no time at all. The designer behind this lovely pair of crocheted coasters with an owl motif is Sarah over at Repeat Crafter Me. You can access the FREE pattern for this fun crocheted set of coasters with an owl motif from Sara’s website. To access the free crochet pattern for these adorable owl coasters, please click here: Christmas Owl Coaster Pattern.